Designed for maximum driver comfort, the FUSO Canter boasts increased overall cab dimensions, wider door apertures, a larger windscreen and robust, stylish and functional mirror arms. The interior features a fully rake-and-reach adjustable steering column, fully adjustable driver’s seat, front passenger split seat with integral headrests, and an easy-clean dashboard. Wrap-around halogen headlamps with clear lens indicators lend a stylish look to the FUSO Canter’s front grille, and a forward-tilting cab provides quick and easy access to its diesel engine. The ergonomically designed in-dash gearshift lever features a short-throw shift mechanism and precise selector gate, and makes cross-cab access more convenient for both drivers and passengers. 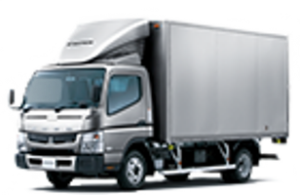 The FUSO Canter features a versatile chassis design for the most applications. Hot-rolled sections with riveted construction make for a lightweight chassis frame that’s tough but flexible, while clear top-rails make body mounting easier and more cost effective. With a capacity of 3 908cc, and producing 81kW/275Nm to 100kW/370Nm on the turbo intercooled version, this engine provides excellent low-speed flexibility, brisk acceleration and outstanding fuel efficiency. These engines are extremely economical and reliable. Crash protection is comprehensively managed through our Realised Impact Safety Evolution (RISE) system. Safety features include reinforced cab floors, collapsible steering columns, cross-doorframe bars and impact-absorbing dashboards made from shatter-resistant materials. ABS and non-asbestos brake linings are fitted as standard on all FUSO Canters. ABS, self-adjusting brakes, non-asbestos brake linings, reverse warning buzzer, tachometer, spin-on type fuel filter, spin-on type engine oil filter, seatbelts, cigarette lighter, heater and defroster, standard tool set, hydraulic jack.